Converts the copper ports on T1/E1 devices, such as a PBX or T1/E1 Router, to multimode or single mode fiber. Extends distances 2,000 meters over multimode fiber or 80,000 meters over single mode fiber. Switch selectable RJ-48 connectors for T1 or E1. Jitter attenuators optimize Bit Error Rate (BER) performance. Network debug procedures make BER testing more convenient. Built-in troubleshooting with the addition of a selectable TAOS (Transmit All Ones) switch on the fiber and copper interfaces allows the network engineer to test all T1/E1 equipment on that network segment and ensure the network link. Dry relay contacts enable the media converter to be tied into a separate alarm circuit commonly found in a T1/E1 twisted pair environment. Contacts will be activated on loss of power or loss of fiber link. An LED provides Alarm Indication Signal (AIS). Can be used with fractional T1/E1 circuits. 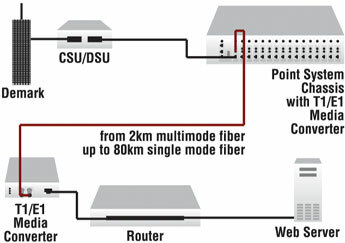 Extend distances over 2 km on multimode connections or over 80 km on single mode fiber. 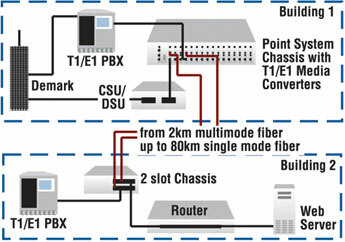 With the exception of Ethernet, T1/E1 is one of the most common campus/metropolitan area networking interconnects. A copper to fiber conversion on the premise side of the T1/E1 makes it easier to integrate voice traffic, frame relay or IP type traffic on your fiber network. Stand-alone can be managed remotely when used with a managed chassis. 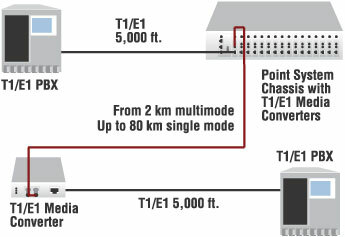 Extend T1 to other buildings in a campus or MAN from 2 km to 80 km for voice or data applications. Software: Converter mode is determined by most recently saved on-board microprocessor settings.